This week’s Photohunt theme is Alive. I’m going to repeat a photo I recently posted of the Lifeguard Station at Makena Beach on Maui where I’m currently visiting. I thought it was so striking. You walk a short distance along a tree covered path before coming onto the beach – this was one of the first things I saw on the beach. Their job is to make certain everyone stays alive at the beach. I hopenapule maika’i – Have a nice weekend. LOL – you and I went in a similar direction today. Enjoy your vacation – I bet the weather is even better there than it is for us in San Diego. Hi Marta, great photo and choice for this week’s theme. I love the bright yellow standout color of this life guard station against the colors of the sand and water and looming dark clouds. 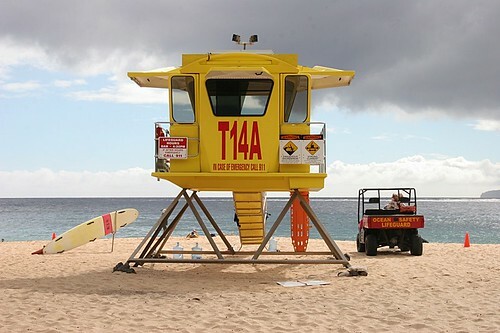 I love the bright yellow, ot life guard stations aren’t this pretty!! great choice for the theme. Happy weekend! I suspect many people owe their lives to it. Gee my inlaws are planning to to Maui sometime after the holidays. That really is a strange looking lifeguard station. Cool photo for the theme! Love the photo! Hope you’re having a wonderful time!